The best super groups are the ones for which the stakes are very low. They don’t need to sell a ton of records or even tour, they just need to have fun and play music together. Glorietta is one such super group, and when they made their debut at Newport Folk Festival in July, it felt like we were all invited to their party – one which began with an AirBnB, a hot tub, and plenty of group hangs and booze. 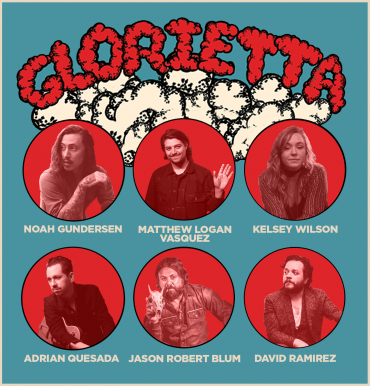 Comprised of Matthew Logan Vasquez (Delta Spirit), David Ramirez, Noah Gunderson, Kelsey Wilson (Wild Child), Jason Robert Blum, and Adrian Quesada, Glorietta is a prolific group of songwriters that should have been just a flash in the pan. It is difficult to recreate the same magical spontaneity of a festival performance, wherein anything can happen. But at a recent show at Brooklyn’s Music Hall of Williamsburg, the gang managed do just that, nurturing their love for each other and the music they’ve made together, and setting it free upon fans that just want to have as much fun hearing them play as they’re having on stage. Similar to the spirit of their set at Newport, Glorietta played many of the songs they wrote together for their self-titled record, and then broke the set up with more intimate performances of each artist’s own material. Songs off their August release like “Loser’s Lament,” “Easy Come, Easy Go,” and “Someday” had an enthusiastic crowd singing along and leaning into the warmth radiating from the genuine friendship on stage. Other moments were quieter and tender, like Gunderson’s lead on “Lincoln Creek,” the heartbreaking ode to the hardships of making a living as a musician. Gunderson continued to stun the crowd with his solo rendition of Nirvana’s “Smells Like Teen Spirit” (a tribute to his Seattle roots). Jason Robert Blum delivered a similarly heartrending moment with his beautiful tune “Wimberly,” and Ramirez had a profound effect on the crowd with his compelling rasp and undeniable charisma on a handful of solo numbers. The vibe of Glorietta’s live shows is laid back and perfect for group hugs and toasting cold ones. It feels like you’re one big group of friends who have been through some sh** together and just want to kick back and reminisce. There is nothing forced or unnatural about this collaboration, and there’s no pressure. Vasquez seemed, as he always does, to be having a blast up there. The glue of the group, he gathered everyone round for a friendship-themed encore that included the band’s original “Friends,” Garth Brooks’ “Friends in Low Places,” and John Prine’s “Angel From Montgomery,” all while professing his love for the people around him. It was a sweet, inclusive moment and a reminder to live in the moment. It may never come again.